Bellflower Infinity Scarf – Free Pattern!!!! My Bellflower Infinity Scarf Pattern is probably my most popular design. It has been offered as a free pattern on Naturally Caron’s website and sadly Caron yarns has discontinued their line of Naturally Caron yarns and pulled their website and along with it, all their free patterns. 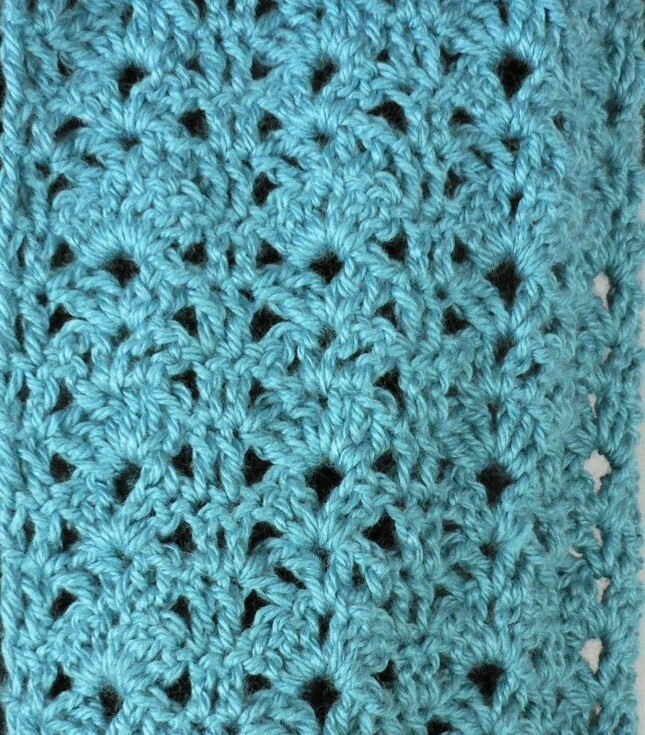 So I am posting the pattern here for free on my blog. The Bellflower Infinity Scarf was made originally in Naturally Caron Joy! yarn, but you can make it in any worsted weight yarn. The softer the yarn, the better– I recommend a yarn with a bamboo blend for a nice drape. You can have fun experimenting with lighter and heavier yarns and just see what you like. Just remember that a lighter yarn is going to result in a narrower and shorter scarf and a bulkier yarn is going to result in a wider and longer scarf, so plan accordingly. Row 1 (RS): Dc in 4th ch from hook (beginning ch counts as dc), *sk next 2 ch, (3 dc, ch 1, 3 dc) in next ch, sk next 2 ch, dc in next 2 ch; repeat from * across, turn—4 pattern repeats. Row 2: Ch 3 (counts as dc here and throughout), sk first dc, dc in next dc, *sk next 2 dc, dc in next dc, ch 1, (dc, ch 1, dc) in next ch-1 sp, ch 1, dc in next dc, sk next 2 dc, dc in next 2 dc; repeat from * across, turn. Row 3: Ch 3, sk first dc, dc in next dc, *sk next ch-1 sp, (2 dc, ch 3, 2 dc) in next ch-1 sp, sk next ch-1 sp, sk next dc, dc in next 2 dc; repeat from * across, turn. Row 4: Ch 3, sk first dc, dc in next dc, *(3 dc, ch 1, 3 dc) in next ch-3 sp, sk next 2 dc, dc in next 2 dc; repeat from * across, turn. Repeat Rows 2–4 until piece measures about 58″/147.5cm. Do not fasten off. Joining Row: Fold piece, bringing first row up to meet last row, working in chains across opposite side of foundation ch and sts of last row (through both thicknesses), sl st in each st across to join piece into a ring. FINISHING: Using yarn needle, weave in all ends. Block lightly, if desired. This entry was posted in Crochet, Uncategorized and tagged Bellflower Infinity Scarf, free crochet pattern, Naturally Caron Joy!. Hi Carrie, I promise I’m not commenting to be rude! I was just wondering if you would be able to suggest a good substitution for the naturally caron joy yarn that would work as good for this pattern. I haven’t mastered the art of yarn substitution yet! I would really appreciate any ideas. Thank you in advance. Hi Gina, Caron Joy yarn is a worsted-weight (#4) acrylic-blend yarn. You should be fine substituting most any acrylic worsted-weight yarn. My suggestions would include: Red Heart Soft, Lion Brand Vanna’s Choice, Red Heart Super Saver, or Caron Simply Soft. You should be able to find one or more of these at your local box store. I hope this helps!